A key leader of Russian-backed separatists in eastern Ukraine has been killed in an explosion at a cafe he owned in Donetsk city, sources in the rebel administration there say. Alexander Zakharchenko’s death was reported by rebel news agency DNR. Ukrainians suspected of being behind the blast were arrested nearby, a security source was quoted as saying. But it had been widely reported that Zakharchenko was out of favour with Russia. Authorities in the “Donetsk People’s Republic” have blamed previous assassinations of rebel leaders on the Ukrainian government, which denies any involvement. Some observers have attributed the deaths to infighting among the rebels, or moves by Moscow to eliminate inconvenient separatist leaders. Russia’s foreign ministry said it suspected the Ukrainian government of organising the latest killing. What are the reports saying? Rebel and Russian news reports say the separatists’ “finance minister” Alexander Timofeyev was wounded in the blast at the Separ cafe that killed Zakharchenko just a few hundred metres from his residence. “According to preliminary information, it is unfortunately true. The republic’s leader suffered a fatal wound,” a senior Donetsk rebel, Vladislav Berdichevsky, told Interfax news agency. Russian foreign ministry spokeswoman Maria Zakharova said “there is every reason to believe that the Kiev regime is behind the murder [of Zakharchenko]”. She said the Kiev “party of war” was “violating its pledges about peace and has decided on a bloodbath”. 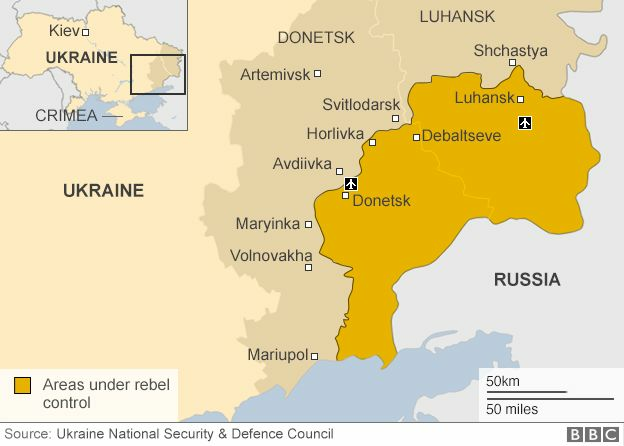 What is happening in eastern Ukraine? Heavily armed rebels in Donetsk and Luhansk regions refuse to recognise the Ukrainian government in Kiev. The rebels seized large swathes of territory there in an uprising in April 2014. Moscow denies sending regular troops and heavy weapons to the separatists, but admits that Russian “volunteers” are helping the rebels. The frontline between them and Ukrainian government troops has remained largely static for months, but skirmishes continue despite a fragile ceasefire deal. There has been shooting on the frontline despite a “back-to-school truce” that was supposed to take effect on Wednesday. International monitors reported 70 ceasefire violations on that day alone. He played a key role in the Russian-backed separatist military operation from its very beginning. In early 2014, soon after Ukraine’s pro-Russian government was toppled by the Maidan revolution, he took part in the seizure of the Donetsk regional administration building by people saying they were protesting against the new pro-Western authorities. Later that year, he was chosen as the prime minister of the self-proclaimed Donetsk People’s Republic by its parliament, the “Supreme Council”. He had been in the role ever since, assuming the title of president, and was among the signatories of the stalled Minsk peace agreement. He was wounded twice in combat, and survived a car bomb blast in August 2014.
Who else has been assassinated in Donetsk? In February 2017 rebel commander Givi (real name Mikhail Tolstykh) was killed by a rocket that was fired into his office.